Build up your confidence with our new Confidence SeriesEyeshadow palettes. 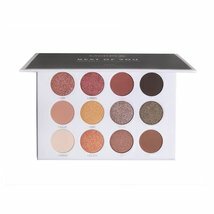 Our Best of You eyeshadow palette features 12 high pigment shades to choose from. Create bold, smokey, or an everyday look with this versatile palette. Showcase the Best of You! Cruelty Free / Vegan Net Wt. 0.04t oz. / 1.13 g (x12) Ingredients INGREDIENTS FOR COLOR NUMBER 1, 4, 5, 6, 7, 9, 11, 12 Mica, Dimethicone, Magnesium stearate, PTFE, Silica, Mineral Oil, Dimethiocne, Boron nitride, Ethylhexyl palmitate, Dimethicone, Pentaerythrityl Tetraisostearate, Phenoxyethanol, Capryly Glycol, May Contain / Puede Contener (/-): Yellow lron oxide (CI 77492), Black Iron oxide (CI 77499), Red Iron oxide (CI 77491), Titanium Dioxide (CI 77891), Manganese violet (CI 77742), Ultramarine Blue (CI 77007). INGREDIENTS FOR COLOR NUMBER 2, 3, 8, 10 Mica, Dimethicone, PTFE, Ethylhexyl palmitate, Dimethicone, Pentaerythrityl Tetraisostearate, Phenoxyethanol, Capryly Glycol, May Contain / Puede Contener (/-): Black Iron oxide (CI77499), Mica (CI777019), Titanium Dioxide (CI77891), Stannic oxide (CI77861, CI77491), Red Iron oxide (CI 77491).